The winning team sing their school song at the end of a game. On Wednesday afternoon, millions of Japanese people will stop what they are doing and turn their attention to the nearest TV screen to follow the fortunes of 18 student athletes. The occasion is the final, decisive game in the national high school baseball championships. The national broadcaster NHK will screen every inning live, the victors are assured of front-page coverage in the following day’s newspapers and, for a couple of hours at least, Japan will come together in the name of amateur sport. Like cherry blossoms in spring, the players are the centre of attention for a very short time, and then they’re gone for good. Most of the players who have taken part in the annual summer tournament will have been forgotten within a few days, while one or two emerging stars will have attracted the attention of scouts from the Japanese professional and US major leagues. A career in professional baseball, though, was furthest from the minds of the players who took to the pitch for the quarter-finals on Sunday morning, watched in the stands by tens of thousands of spectators. 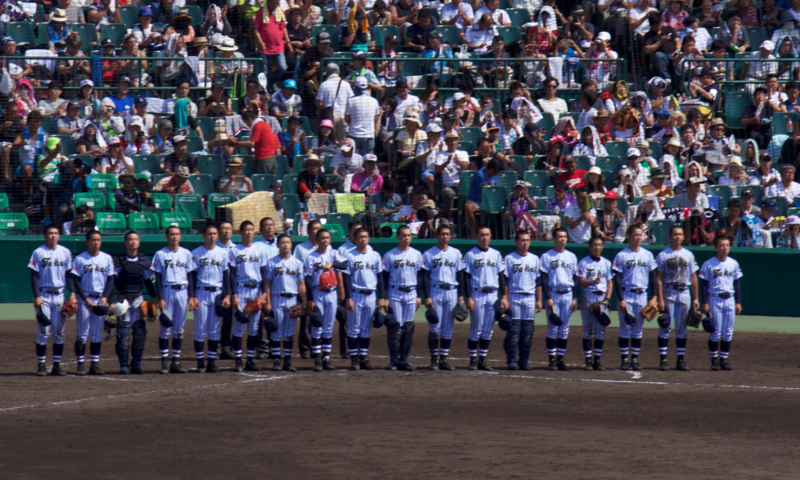 As they lined up under the scorching sun and bowed at each other in unison before the start of the first inning, they were united by an all-consuming dream: to win at Koshien. Located in an unfashionable neighbourhood between the industrial city of Osaka and the historical port of Kobe, Koshien stadium is the undisputed spiritual home of Japanese baseball. The summer high school competitions, plus an invitational version in the spring, even take precedence over Koshien’s regular occupants, the Hanshin Tigers professional baseball team, who are banished from their home for the duration of the tournaments. Household names in baseball – from Japan’s home run king, Sadaharu Oh, to Ichiro Suzuki and other US major league Japanese imports – have appearances at Koshien as teenagers to thank for their start in the professional game. Simply to swing a bat or pitch a ball on its hallowed ground – let alone win the tournament – is the ambition of every Japanese high school pupil to have pulled on a baseball jersey since the tournament began in 1915. The exploits of Koshien’s young stars over the decades have been immortalised in film, on television and in manga comics. For two weeks in August, sports fans talk of little else as they follow the fortunes of 49 teams – one from each prefecture, plus an extra each from Hokkaido and Tokyo – to have made the cut from among 4,000 hopefuls. Experts attribute Koshien’s enduring popularity to a combination of tradition and a deep sense of regional pride, both among the players and spectators, many of whom travel huge distances to watch their local team. But most of all, the players – from their closely cropped hair to their predominantly white uniforms – hark back to an age when teams were seen as the embodiment of the traditional values of sacrifice, diligence and teamwork. “There is also something very Japanese about kids playing baseball at this level for such a short time, since they are only at high school for three years,” said Jim Allen, a veteran sports writer for the Kyodo news agency. The tournament is also a reminder of high school baseball’s less wholesome side. Stories of coaches and senior players bullying and abusing younger teammates are not uncommon. There is criticism, too, that the demands of training in preparation for the long qualifying road to Koshien exact an unacceptably high physical and mental toll on players who are still in their teens. “There is a dark side – a mean, sadistic side – but that has been part of all sports in Japan since late 19th century and before,” said Robert Whiting, the author of two critically acclaimed books about Japanese baseball, You Gotta Have Wa and The Meaning of Ichiro. “Ace pitchers will pitch several days in a row and risk permanently damaging their arms and losing a lucrative pro contract worth millions. Performing and winning at Koshien is more important than being rich. It’s a once-in-a-lifetime thrill and an honour that can’t be duplicated. Sunday wasn’t to be Wakayama’s day. His son’s school were knocked out in a one-sided game. Wednesday’s final, in front of 40,000 spectators, will be contested by schools from Saitama and Hiroshima prefectures. At the end of that game, as in every other, the players will exchange bows and handshakes, before the victors rush over to their supporters to celebrate. The losers, meanwhile, will drop to their knees in tears and scoop handfuls of Koshien’s sacred dirt into bags as mementoes of their brief time at the heart of a national sporting obsession. “I’ve always told my son that I don’t expect anything from him,” Wakayama said. “I just want him to enjoy himself and savour every moment.